Learn to be more profitable without the headaches. We will create a one of a kind solution for you! 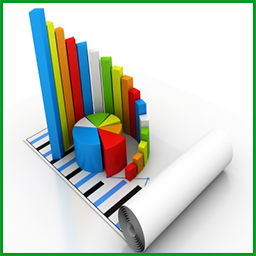 Whether you need tools to start your business or you want to re-examine your financial strategies we can help. Sign up for our newsletters using the tab at the right of the screen and get access to useful financial information - for free! Read our blog for useful financial advice, interesting articles and our previous newsletter issues. 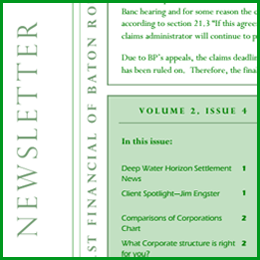 First Financial of Baton Rouge, LLC is a certified IRS tax preparation organization (PTIN P01505501). We can provide the following services. 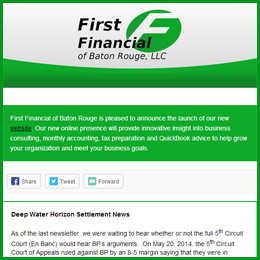 First Financial of Baton Rouge, LLC can make your business better. In many cases, we have brought businesses from the brink of disaster. For other businesses, we were able to show them how to be more profitable with less headaches. 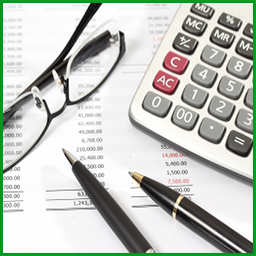 We can implement systems in incorporating QuickBooks to make your company run smoother and more efficiently. Monthly accounting services from only $150/month for 50 Transactions! 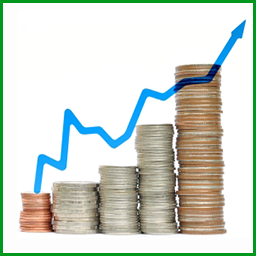 We provide profit & loss statements, a profit analysis report and more! Find out more today! Every new enterprise and even a well established business needs to have a sound team of skilled and experienced professionals who can deal with and take care of all the financial activities of the company. 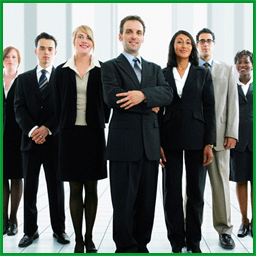 For those who are new in the market or lack the expertise needed to battle it out in the financial sphere of the industry, it is advisable to seek the service assistance of professionals who promise you the required support to propel the business to a stable position in the industry. Small business management consultants offer tax preparation fees assessment assistance along with monthly accounting help services for the help of businesses. Baton Rouge management consultants are a strategic business consulting firm offering services for needed financial assistance in the industry. At First Financial Baton Rouge, we understand more there's more to running a business than having a sound financial structure, Customer Service for your customers is the lifeblood of your business and it's the same at our offices. We strive to create and manage long term relationships with our clients, and provide support and a friendly ear whenever you need it. We have a large a varied pool of experience to draw from, we have worked with start-ups, small, medium and large companies. That's why you can count on us to get your accounts in shape, no matter your companies size or financial state. At First Financial Baton Rouge, your Finances come first, but a large aspect of our business is giving back to the community that supports us. You can find us out there setting up tables and chairs, and running multiple community events rain or shine, we do what we can to support our great city, and the citizens of Baton Rouge. Helping businesses reach their goals since 2006. Let us help you today, let's build a better business together!